California's Gold Country, known historically as the Mother Lode, is located in the foothills of the Sierra Nevada Mountains. It was here that the famous goldfields of the Gold Rush were located. From 1849 onward, thousands of miners flooded into the area. These men brought with them a powerful thirst, which they sought to slake with their beverage of choice—beer. As quickly as rudimentary towns were established, breweries were erected to supply miners with their desired drink. These breweries produced regionally crafted beers for surrounding populations, and some gained national and international recognition. Many also housed saloons, which became an integral part of these foothill communities. A number of these establishments remained in operation until Prohibition, which ended most local brewing. 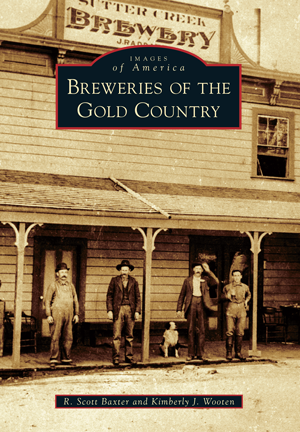 This volume seeks to document the Gold Country breweries and the brewers who operated them. R. Scott Baxter and Kimberly J. Wooten are historical archaeologists and have coauthored several volumes in the Images of America series. Both have been professionally active in the fields of archaeology and history for over two decades. They live in the heart of California's Gold Country, where they enjoy the products of the region's modern-day breweries and the history of those long gone.